AC Milan new signing Gonzalo Higuain revealed that he was interested in joining Chelsea but the blues coach Maurizio Sarri was the only one who seems interested in having him at Stamford bridge. The former Napoli striker had a wonderful time playing under Sarri at Napoli, scoring a record-equalling 36 league goals, winning the Serie A highest goal scorer. During his first press conference at AC Milan, the former Real Madrid striker said it was only Sarri that wanted him at Chelsea despite been heavily linked to the former Premier League champions, but Milan director Leonardo was more convincing which led to his decision to join the Italian giants. "I have big respect for Sarri but he was the only one who wanted me at Chelsea," Higuain said. "Here at Milan everyone wanted me. That's why I chose Milan. The motivation and conviction they showed at Milan was fundamental." 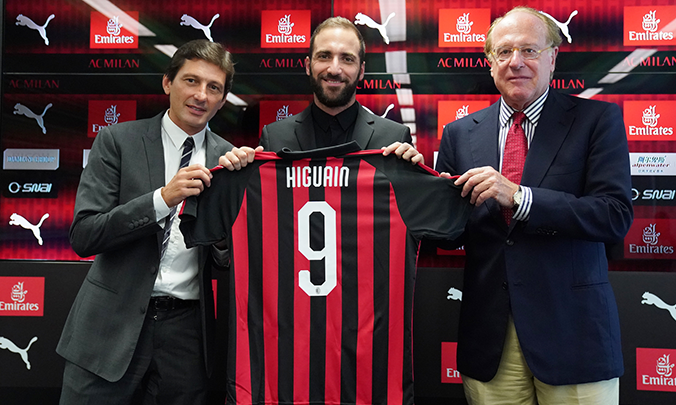 Higuain was unveiled as a Milan player on Friday, less than 24 hours after signing for the club from Juventus on an initial loan deal worth €18 million that has a €36m option to make the deal permanent.